Last week at stamp club we focused on Christmas cards. And made me realize that I really need to get working on ours lol. I love this cute little card. The stocking are just too adorable! Back from a fabulous weekend and jumping right into the final Christmas push at work. I made this cute disappearing 9 patch runner for a friends birthday. Sorry for the crazy pictures. I took them way too late while in a hotel room lol. She loves green so I raided mom's batik stash and came up with these. I've been having a lot of fun lately with batiks; I'll show you more later this week. I'm off for a girls weekend away and I did not have time to schedule some posts; my apologies! 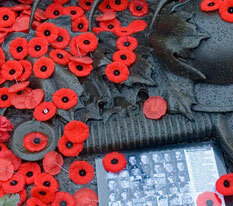 Have a wonderful weekend and happy Thanksgiving to my American readers. Anyone know the pattern I am referring too? And if so, can you point me in the right direction please? And I was oh so close to finishing the binding before packing up all my fall decorations to bring out the Christmas ones lol. In a saucepan, melt together peanut butter and butter or margarine. Add the icing sugar and graham cracker crumbs. Blend together. Pour and press into a 9"x13" pan. Melt the butter and chocolate chips together. 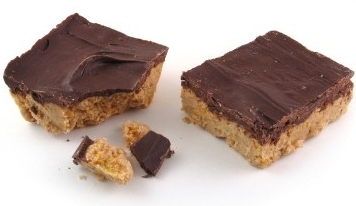 Spread the mixture on top of the squares. Put the squares in the refrigerator to firm up. Take them out of the fridge and leave them at room temperature for a while before cutting so the chocolate doesn't crack. A few years ago, I was given 4 cards. Each card represented the covers of the four Twilight novels. I knew I wanted to frame them but I wasn't sure how I wanted it done. This past winter, I got a coupon in the mail for a popular craft store; they were offering their framing services at 50%off. What a bargain! So off I went with my precious cards to have them framed. I knew it would be a wee bit pricey; the cards were an odd size. I picked out the nicest(and cheapest) frame, a mat; I wanted simple colors to make the cards pop. The employee rang in my selections, discounted it then stunned me with the total. Even after my 50% off, the total was still in the triple digits. But I went ahead with it. And even though I spent a small fortune, I feel it was worth it. I love how they look. Sorry about the crocked picture! It's late(preposting this Wednesday night) and I'm all wired up on peppermint mocha lol! Now it's time to head to the airport, pick up my bestie and go watch a movie!! I feel like a kid at Christmas. 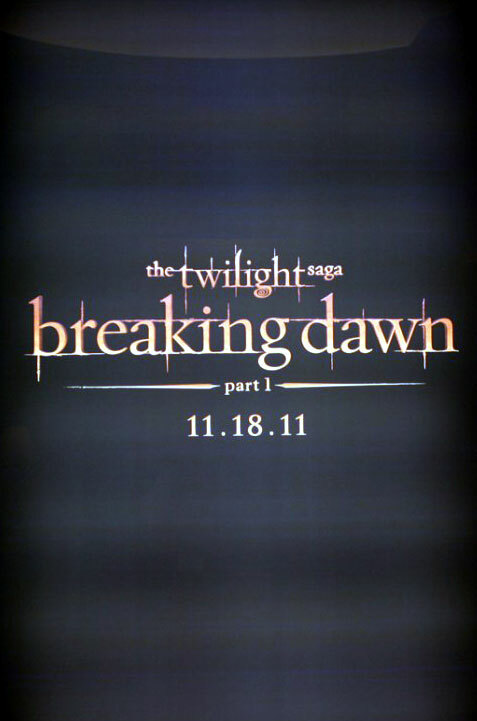 Not only is Breaking Dawn part 1 opening tonight, my bestie arrives just before to spend the weekend so we can watch the movie together. One of my friends made me the bestest best gift for my birthday. I had an idea she was up to something and she got me good! 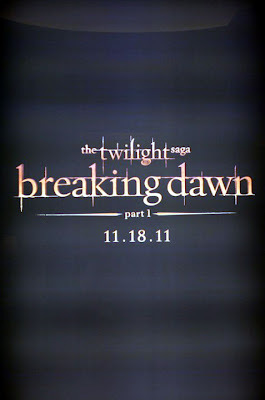 You may have noticed that I am a Twilight fan( 2 more days until Breaking Dawn!! WOO HOO!). Anyways, Cheri Lynn got me the best gift ever. She found a wooden box and repainted it. There are 2 that say Twilight in black. The others have each book title in white then the symbol for each book on the other side. I LOVE them!! One of the best gifts ever to add to my Twilight collection! I love love LOVE this quilt. I can't decide if it's the fabrics that I love so much(based our recent home renos on this fabric line lol) or the cross-hatch quilting. Either way, it's perfection in my books! Sprinkle bread in sprayed 2 L (8 inch) square baking dish; set aside. In bowl, whisk together eggs, egg whites, applesauce, milk and cinnamon. Pour over bread and press bread gently into egg mixture. Bake in 190°C (375°F) oven for 30 minutes or until golden, puffed and knife inserted in centre comes out clean. Serve each piece with dollop of yogurt, apple and sprinkling of cinnamon, if using. 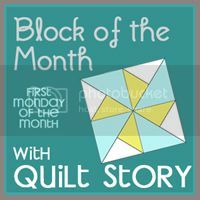 That I have a client request a pattern that I haven't quilted already. 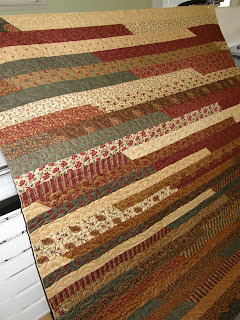 So when Donna requested Woodgrain for her quilt, I jumped at the chance. Perfect pattern for this quilt. I love how it shows up in the borders and check out the backing. 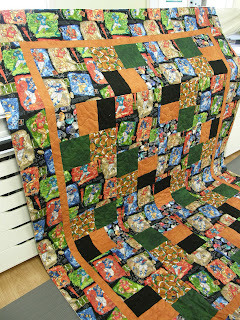 And because this quilt was so quick to do, I got to sneak in one of my own. 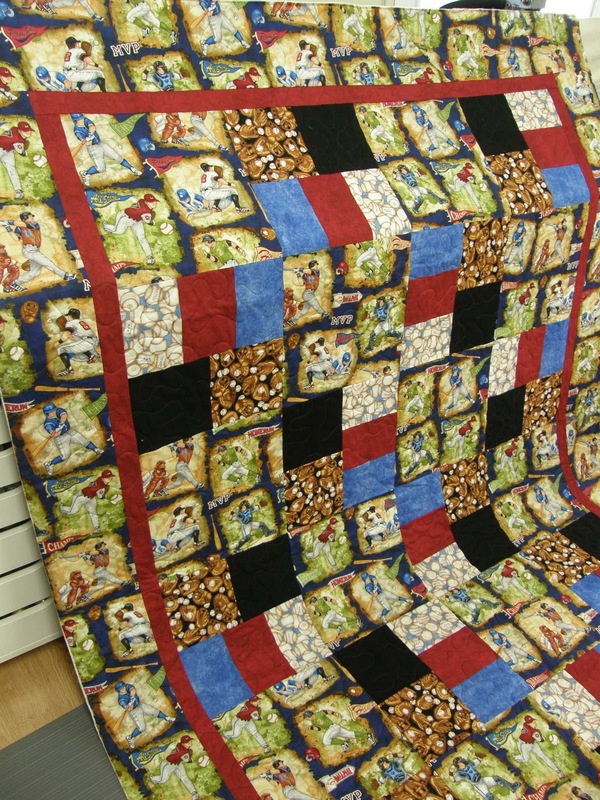 I thought and thought of how to quilt this runner. I've already unquilted it once. And I love the shape in Paisley Max and need more practice on free-handing it so this was perfect practice. And I love how it turned out. 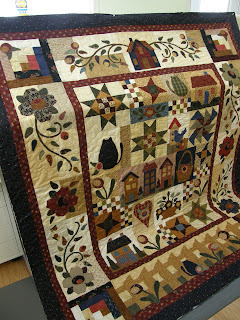 Hamels Quilt store has been keeping me busy(and out of trouble lol) with the last few quilt shows of 2011. Yes, it's almost time to start thinking of the 2012 shows! 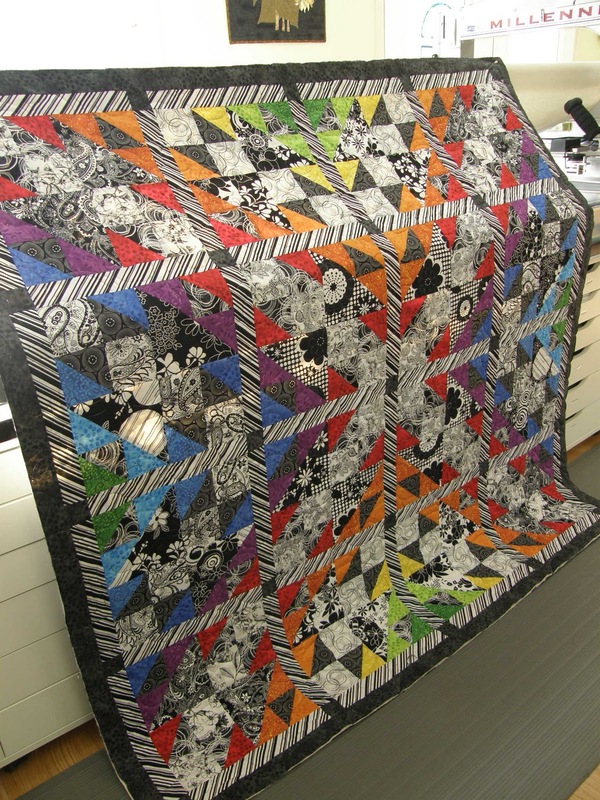 I also want to show you a straight line quilt I did for a customer. 130 inches of straight lining. On decorator fabric. 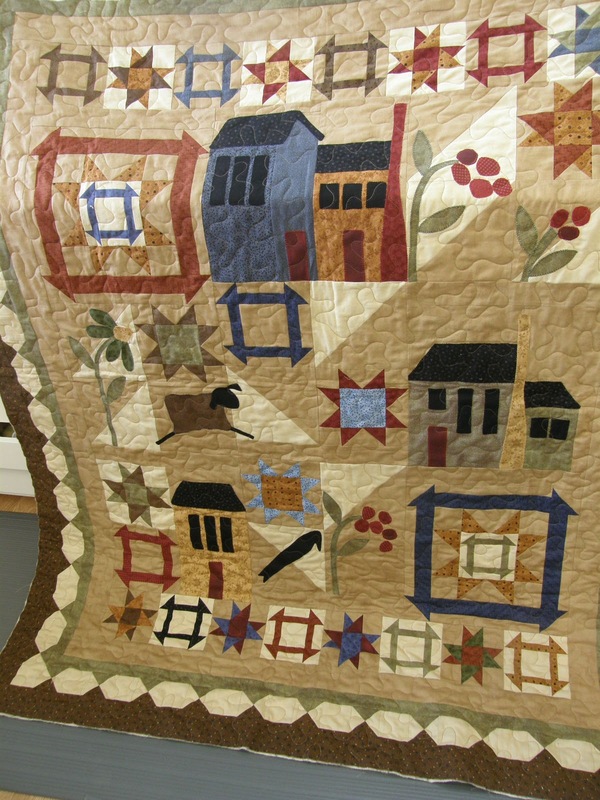 This quilt was heavy when finished. But wow did it look neat! Too big to even get a full picture of! Of the fabric stack, Life in a Pink Bunny Suit. and the pattern winner is Sallie. Thanx for entering! Winners, I have contacted each of you. Made for a co-worker of Jim's. 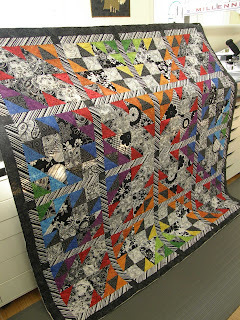 This is the second baby quilt I have gotten using a Pure layer cake and this Moda Bake Shop recipe(here). I did change the pattern up a bit, so that might be why I have this many extra blocks. This one I had to straight line; I love the look of it against all the white. 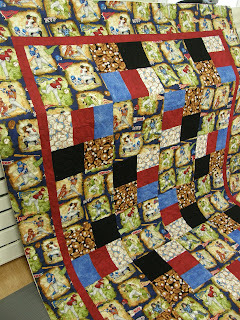 And the fun polka-dot backing; flannel of course! Now to get the binding done and get this delivered! 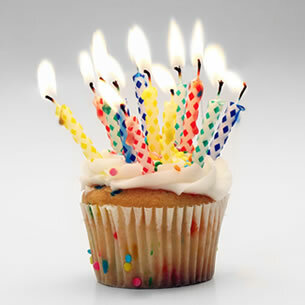 I'll be back later to draw the winner(s) in my birthday giveaway. If you haven't entered, you still can here! Preheat oven to 375 degrees F. Grease three 9-inch cake pans and line each with a parchment paper round. Cream the butter and sugar until light and fluffy. Beat in the molasses, and then the eggs, one at a time, beating between each addition. In another bowl, mix together the flour, baking soda, salt, and ground spices. Add the flour mixture to the batter alternately with the sour cream, starting and ending with the flour mixture. Stir in the shredded apples and vanilla. The batter will be thick. Evenly distribute the batter among the three pans. Bake until the cakes are lightly browned on top and set. Cool in the pans for 10 minutes, then unmold and cool completely on wire racks. In the bowl of an electric mixer, combine the butter and cream cheese until softly whipped and it produces a “glupping” sound as it beats. Gradually add the confectioners sugar until a desirable consistency is achieved. Add the bourbon whiskey and caramel sauce to taste. This makes a lot of frosting. Place the sugar in a pot and add the water and lemon juice/cream of tartar. Make sure there are no sugar crystals along the inside of the pot and that all the sugar has been hydrated by the water. Bring to a boil over high heat until the sugar is a dark amber color. Remove from the heat and add the butter and warmed cream slowly, as the sugar will bubble up violently. If you are nervous about cooking caramel, use a long whisk. Let the caramel cool, then use as desired. And YOU get the gift! 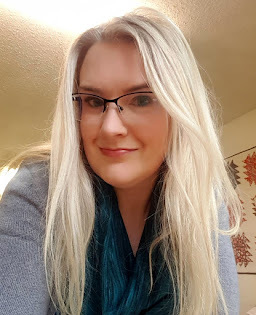 Since it's my birthday and I missed my blogversary last week(6 yrs!!!! ), I thought why not do a little giveaway? What can you win? Well, let's start with a variety of cards made by me. Simply leave a comment on this post to enter. Easy peasy. Please make sure I can contact you if you are the winner. Contest will be open until Sunday evening. I haven't decided yet if I'll do 3 winners, 2 winners or 1 winner. Let's see how many entries we get. I should be binding the table runner underneath Gizmo but he looks just too comfy to disturb. Instead I finished off another Swoon block. 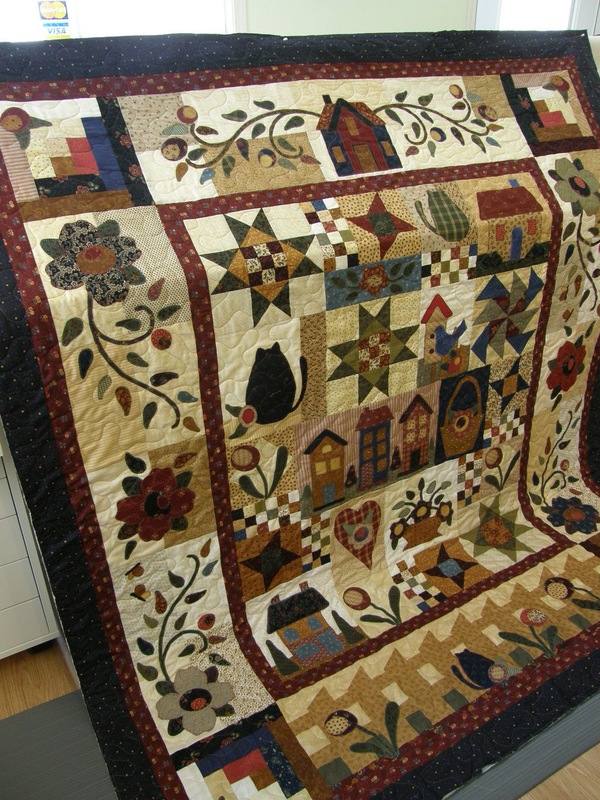 The last block is almost finished but I'm feeling tired so I felt I should stop or I would be unsewing. Then I figured my plan of attack with these. Nine jelly rolls + 6 meters coordinating fabrics = 3 commissioned twin quilts for Christmas. I better get a move on!